SchoolLoop allows students to do some of the teacher's work by letting them publish assignments, lessons and units, using Curriculum Groups. This saves the teacher's time and can be a great learning experience for students. 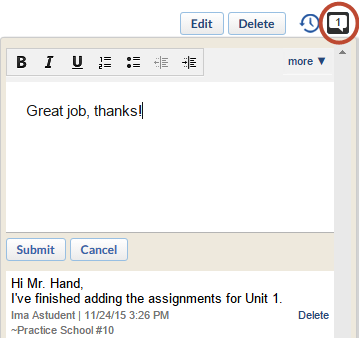 Student helpers can publish assignments, lessons and units to the group and add files to the group locker. Once content is published, it is available to all of a teacher's courses. Create a Curriculum Group and add students as teacher aides or publishing aides to the group. Go to the Classroom> Curriculum tab for the desired course. From the Add Content menu, select Import from [name of the curriculum group]. 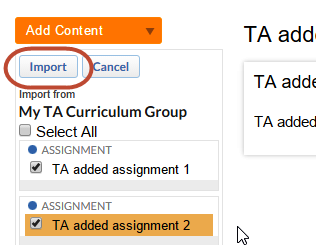 Check the content a teacher wishes to import and click the Import button. Edit and publish the content to have assignments added to the Gradebook. Use the Instructional Plan in Units and Lessons to give students instructions for posting content. Use the discussions built into the curriculum to collaborate with students as they create content. All successfully published assignments, lessons and units are available for teachers, students and parents to see.